The impressive find has been announced by Bulgarian archaeologists Filip Petrunov, Boni Petrunova, and Nikolay Ovcharov at a press conference in Bulgaria’s National Museum of History, as cited by the Novinar daily. The coin from India found at the Urvich fortress weighs 11 grams, and is made of high-carat gold. 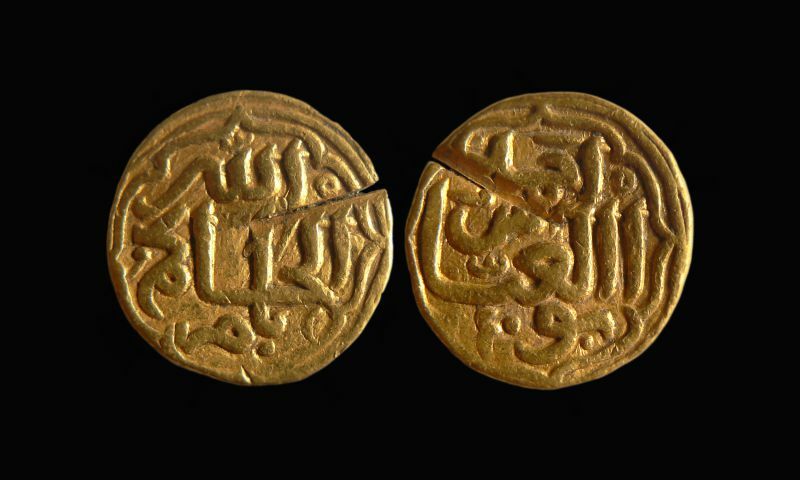 According to the Bulgarian archaeologists, it was minted by Indian Muslim ruler of the Delhi Sultanate, Muhammad bin Tughluq. Muhammad bin Tughluq was the Turkic Sultan of Delhi from 1324 until 1351 AD. In the words of the Bulgarian archaeologists, he was known to have been under the tutelage of Al-Hakim II, Caliph of Cairo between 1341 and 1352 AD, and very close to the Sufis, the practitioners of Muslim concept of Sufism. Prof. Nikolay Ovcharov has speculated on the different ways through which the Indian coin might have ended up in the Second Bulgarian Empire (1185-1396 AD). In his words, it might have been moved west together with Mongol troops as they were invading Asia Minor at the time. Another possibility is that it was brought by an Indian merchant. In any case, the discovery of the Delhi Sultanate coin at the fortress of Urvich right outside of Sofia is construed by the Bulgarian scholars as a testimony to the international significance of Urvich in the 14th century when as a fortified town it was supposed to protect the city of Sofia, back then known by the name of Sredets. The Indian coin bears a scratch which according to the archaeologists was most likely made by Bulgarians in the Middle Ages as they probably tried to check whether the coin was really made of gold. Another truly unique recent find from Urvich presented by Petrunov, Petrunova, and Ovcharov is a 5.3 cm lead figurine of a soldier holding a spear. It has been discovered in an archaeological layer from the 5th century AD when there was a late Roman defense fortification at the same site. 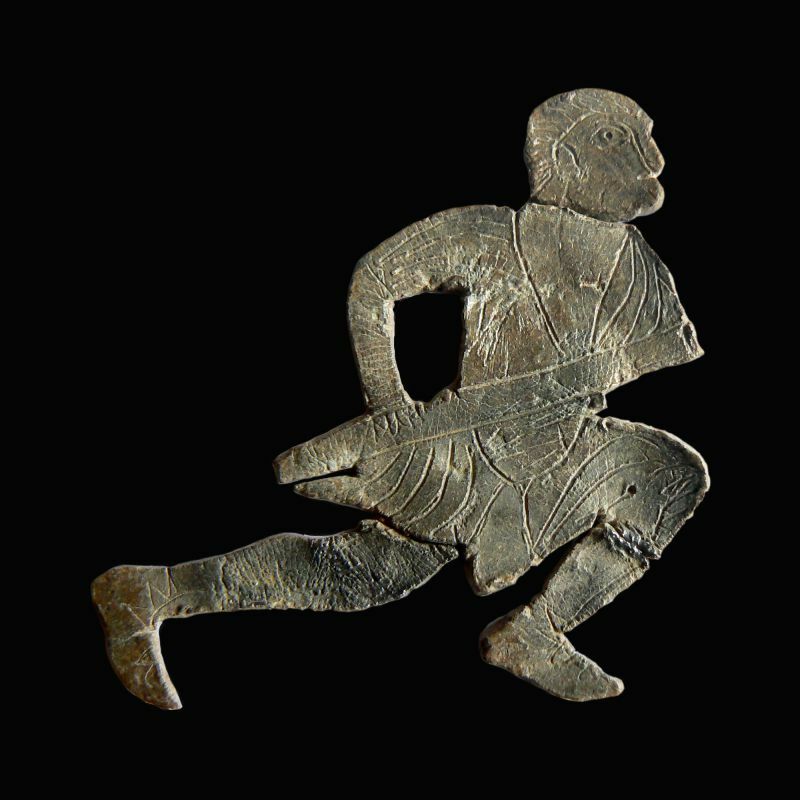 The lead soldier figurine might have served as an amulet of some of the warriors defending the late Roman fort at Urvich, the Bulgarian archaeologists have speculated. The figurine itself is extremely detailed as the legionnaire’s shoes, helmet, and face are clearly visible; part of his spear, however, has broken off. The legionnaire is depicted attacking. Because of that and his unusual position the archaeologists surmised at first that the depiction might be of a barbarian warrior but later they made out the Roman art style typical after Emperor Constantine the Great in which eyes are depicted enlarged. The discovery of the figurine dating back to the late Antiquity is taken by the researchers to testify for the long life of the fortress of Urvich, which is known primarily for its role in the Middle Ages, mostly during the time of the Second Bulgarian Empire (1185-1396 AD). However, it was certainly used during the late Antiquity as well as later during the period of Ottoman yoke when Bulgaria was conquered by the Ottoman Turks. After Bulgaria’s destruction by the Ottoman invaders Urvich became the site of a Bulgarian monastery surviving almost until the second half of the 18th century. Another interesting item discovered during the latest excavations at Urvich is a part of a female tiara from the 14th century AD. This is taken to demonstrate that there were Bulgarian aristocrats present in Urvich at a time when the fortress was defending the road to Sredets (today’s Sofia) from the Ottoman Turkish invasion. Such a conclusion also corresponds with the legend that Ivan Asen V, the brother of Tsar Ivan Shishman, the last Tsar of Bulgaria proper (i.e. the so called Tarnovo Tsardom), fought at the fortress of Urvich for many years against the invading Ottomans, and that it was his wife Elena who founded the Urvich Monastery. According to Boni Petrunova, Prof. Nikolay Ovcharov, and the head of Bulgaria’s National Museum of History Bozhidar Dimitrov, the fortress of Urvich can be partially restored, and the medieval church there can be rebuilt in its authentic style in order to host religious services once again. Sofia Deputy Mayor Todor Chobanov has also supported this idea. It has also been announced that the students from Sofia University “St. Kliment Ohridski”, New Bulgarian University, and Plovdiv University “Paisiy Hilendarski” who took part in the excavations of Urvich are drafting a children’s book which is to show what the life of the monks in the Urvich Monastery looked like in the 15th-17th century. The excavations of the Urvich fortress are set to continue in 2015 under archaeology project funded by Sofia Municipality, which is entitled “Urvich – The Last Fortress of the Shishman Dynasty”. The excavations are led by Boni Petrunova, Filip Petrunov, Prof. Nikolay Ovcharov, and Elena Vasileva. The fortress of Urvich is located some 20 km southeast of Bulgaria’s capital Sofia. The medieval fortress there was built in the 9th-10th century by the First Bulgarian Empire, possibly as early as the reign of Khan (or kanas) Krum (r. 803-814 AD) who first conquered Sofia for Bulgaria in 805 AD, and was lated developed during the reign of Tsar Ivan Asen II (r. 1218-1241 AD). It was first excavated in 1969 by Prof. Dimitar Ovcharov, father of Prof. Nikolay Ovcharov. Prof. Nikolay Ovcharov has resumed the excavations there in recent years. The Urvich archaeological site bears marks from different time periods – from the Roman Empire in the late Antiquity, Byzantium, the First Bulgarian Empire (680-1018 AD) and the Second Bulgarian Empire (1185-1396 AD) to the Ottoman Empire. In Bulgarian culture and national memory it is mostly known as a site of heroic resistance against the Ottoman Turkish invaders in the second half of the 14th century by some of the last state leaders of medieval Bulgaria, defending the strategically vital city of Sredets (today’s Sofia). As the Second Bulgarian Empire was being conquered by the Ottoman Empire in the late 14th century (Sofia was conquered in 1385 AD), the Urvich fortress was set on fire but was later rebuilt and used by the Ottoman Turkish invaders; the local monastery was also restored. The archaeological excavations at Urvich have unearthed murals from the St. Iliya (St. Elijah) Church and St. Iliya Monastery, and some of the frescoes have been shown to the public. It has also been emphasized that there is information about the monastery at Urvich in the first History of Bulgaria, the Slavic-Bulgarian History, compiled by the Bulgarian monk Paisiy Hilendarski in 1762 AD, which was the book that essentially laid the foundations of the modern-day Bulgarian nation leading to the so called period of Bulgarian National Revival (late 18th-19th century). There is evidence that the St. Iliya Church at the Urvich Monastery was restored in the 15-17th century. Back in 2011, Prof. Nikolay Ovcharov unveiled 18 gold coins found at Urvich which were minted by medieval Bulgarian Tsar Ivan Alexander (r. 1331-1371). They are believed to have been part of a legendary medieval Bulgarian treasure – “treasure of the Shishman Dynasty", which ruled Bulgaria from the ascension of Tsar Ivan Alexander to the throne in 1331 AD to the demise of his sons – Tsar Ivan Shishman (r. 1371-1395) and Tsar Ivan Sratsimir (r. 1371-1396) in the hands of the Ottoman Turks. It is believed that sometime in 1371-1372 AD the last Tsar of Bulgaria Proper, Ivan Shishman, buried his treasure at the fortress of Urvich where his forces made a stand against the invading Ottoman Turkish forces fighting fierce battles during the 1370s and 1380s. The archaeologists believe that Tsar Ivan Shishman’s treasure really existed but that most of it has been snatched by treasure-hunters and that the 18 gold coins found at Urvich are everything that is left of it. The Shishman Dynasty ruled Bulgaria from the ascension of Tsar Ivan Alexander (r. 1331-1371 AD) to the throne in 1331 AD to the demise of his sons – Tsar Ivan Shishman (r. 1371-1395) and Tsar Ivan Sratsimir (r. 1371-1396) in the hands of the Ottoman Turks. Tsar Ivan Alexander was one of the most notable but also most controversial rulers of the Second Bulgarian Empire (1185-1396). He had one of the longest reigns in Bulgaria’s medieval history which is known as a Second Golden Age for medieval Bulgarian culture, literature, and education (the First Golden Age being during the reign of Tsar Simeon I the Great – 893-927 AD). A prominent example of the achievements of the Second Golden Age is the so called London Gospel Book – an illuminated manuscript Gospel Book written and illustrated for Tsar Ivan Alexander in 1355-1356 which is kept today in the British Library in London. Politically and militarily, however, Tsar Ivan Alexander’s reign eventually proved to be disastrous for Bulgaria after he lost major Bulgarian-populated territories to Serbia and the Byzantine Empire, which at the time was using Ottoman Turkish mercenaries who later became invaders in their own right. Tsar Ivan Alexander lost his two eldest sons – Ivan in 1349 AD and Mihail in 1355 AD – in battles with the Ottoman Turks. What is more, he failed to prevent a number of Bulgarian feudal lords seceding, and on top of that divided the remainder of the Bulgarian Tsardom between his two surviving sons. His third son Ivan Sratsimir (r. 1371-1396) received the smaller so called Vidin Tsardom, with the Danube city of Vidin as its capital, and his fourth son Ivan Shishman (r. 1371-1395) received the rest, the so called Tarnovo Tsardom, with the capital proper of Tarnovgrad (today’s Veliko Tarnovo). Just two decades later all Bulgarian lands, disunited and even warring among themselves, fell prey to the invading Ottoman Turks, ushering Bulgaria into five centuries of Ottoman yoke and signifying a practically irreversible loss of its former great power status.